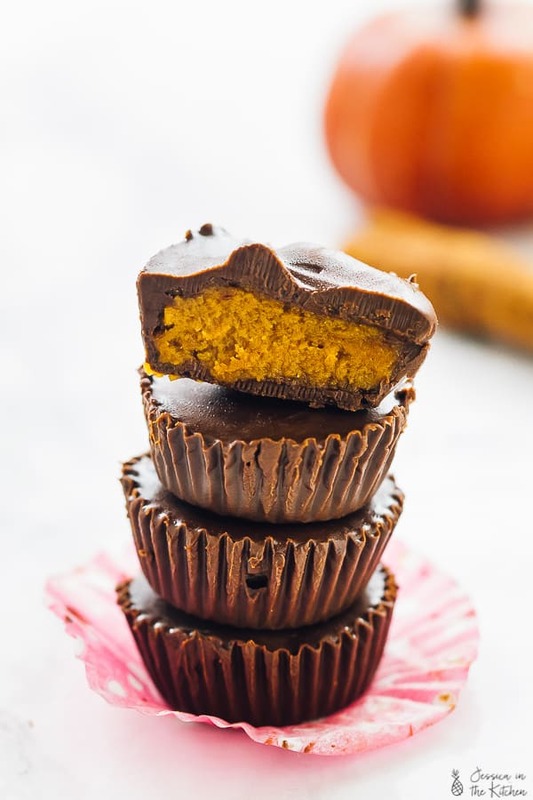 These Pumpkin Chocolate Cups are a delicious holiday candy treat! They’re packed with yummy pumpkin flavour, are easy to make and are vegan and gluten free! Once upon a time (aka when I was back in high school 600 years ago) I threw a super cool (in my view) Halloween party. I literally sat down and cut out like 50 bats out of black cartridge paper and bought all the fake skulls and fake web I could. Halloween used to be one of my favourite “holidays” and it’s been a while since I’ve even done anything to celebrate it. I’m pretty sure Thanksgiving and Christmas took its place. 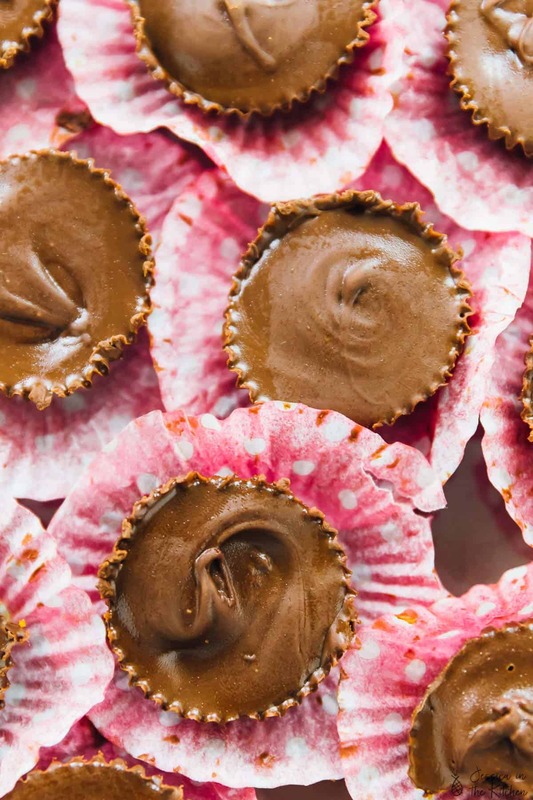 Anyway, I realised that these Pumpkin Chocolate Cups are little candies that would be a perfect way to celebrate Halloween or any other holiday party. Or you know, just life, cause they’re perf for any celebration. Little morsels of goodness indeed. Speaking of Halloween, what are you doing for it? Are you going out and celebrating, or do you have little ones are you’re taking them trick-or-treating? My plans include eating these Pumpkin Chocolate Cups and watching Stranger Things 2. My life has basically been in limbo this last week as I sit and stare at the Netflix countdown waiting patiently for it to come back. I’ll probably make some caramel corn while I’m at it and maybe even grab one of those skulls to “decorate” the TV area to get in the spooky mood. If you guys haven’t watched Stranger Things, PLEASE improve your lives and get on it. Okay, before I fall into a total Stranger Things stan conversation, let’s get back on track. These cups will rock your life. 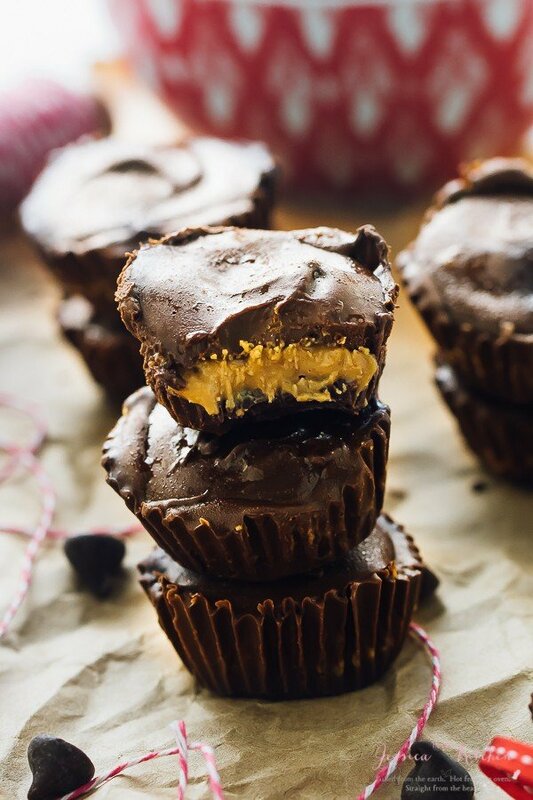 I’ve made peanut butter cups before, but these really take it up a notch. 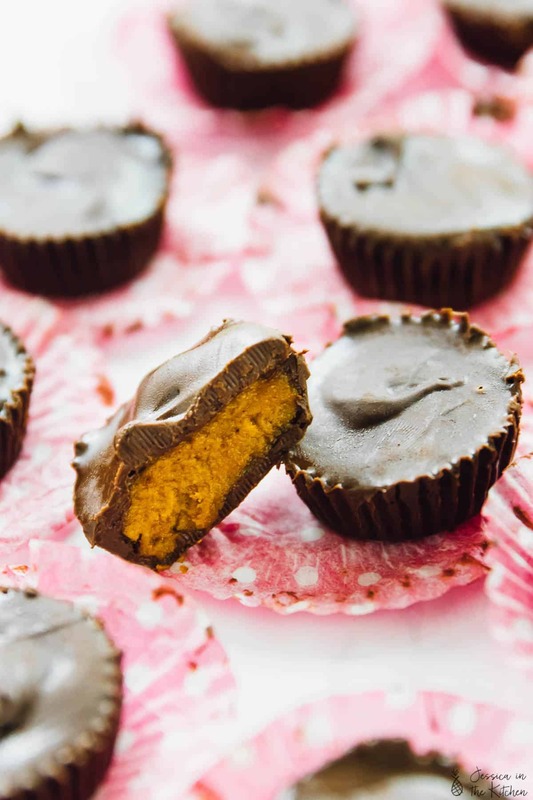 In an effort to put pumpkin into all the things this fall, I knew I wanted to make some kind of easy candy with pumpkin, when these popped into my head. I had just used this same container for my Cauliflower Pizza Bites and remembered devouring, I mean sharing, my peanut butter cups last year. I still have endless amounts of pumpkin puree left over and was like hey, self, we should totally make chocolate cups but with pumpkin too!! Okay, so if you’ve never tried pumpkin and chocolate, trust me, you’re missing out. They are a fabulous duo. Whether it’s chocolate and pumpkin sweet bread or breakfast cookies, they pair so well together. These cups have a delicious, pumpkin flavour that’s amped up thanks to the addition of pumpkin spice in their too. 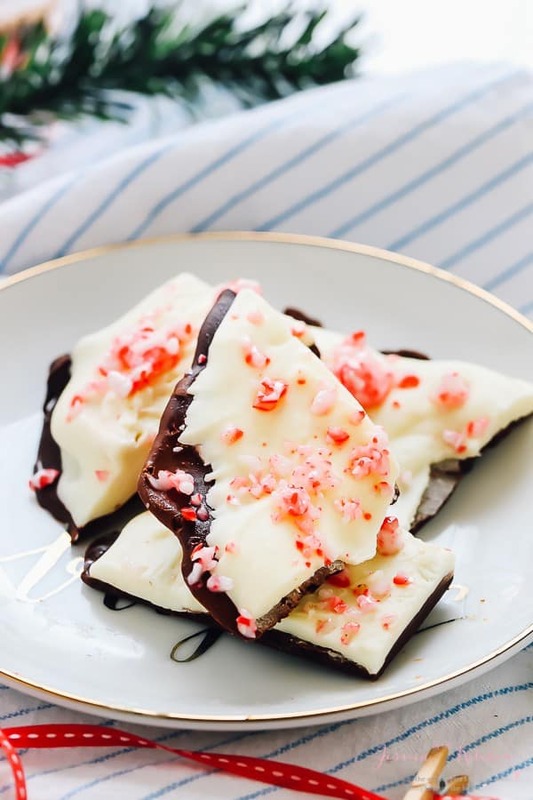 They’re the perfect quick and easy no bake holiday candy. Enough of my rambling, go off to make and enjoy these! They’re great if you need treats in a pinch. Friends coming over, movie night, or to give to kiddos. Chances are they’ll be done before the first half of your favourite Halloween movie. Enjoy friends! 1. Line a mini muffin tin with 12 mini cupcake/muffin liners. Set aside. 2. 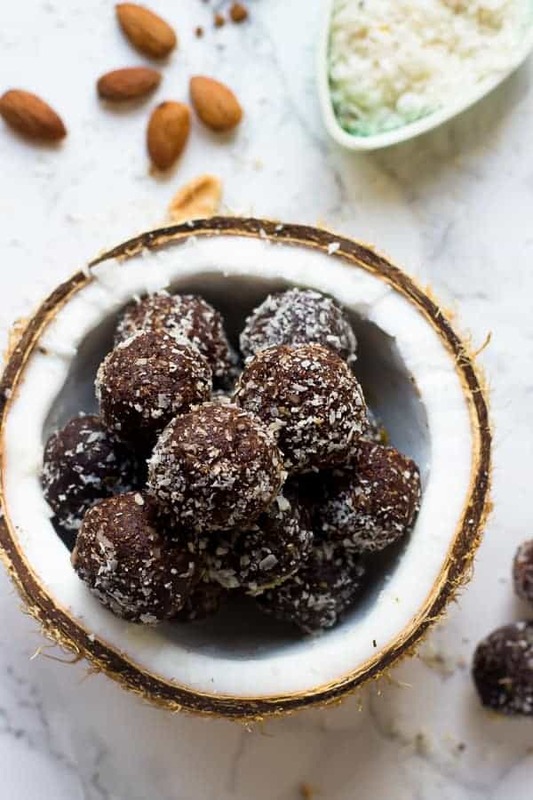 In a bowl, add the chocolate chips and the coconut oil and stir together. Melt them in the microwave for 1 minute, then stir together until melted. If they aren't fully melted yet, you might need to microwave them for 30 seconds at a time until melted. You can also melt them in a double boiler method. 3. Spoon a little bit of melted chocolate into each of the muffin liners, and spread it so it covers the bottom, as well as ¾ way up the liners with the back of your spoon. This will ensure the pumpkin peanut butter filling is covered properly. 4. Put in the freezer for about 10 minutes to set. 5. In a small bowl, mix the peanut butter, pumpkin puree, pumpkin pie spice and coconut sugar and stir until thick and like a sticky dough. 6. Remove the mini muffin tin from the freezer and set beside this bowl. 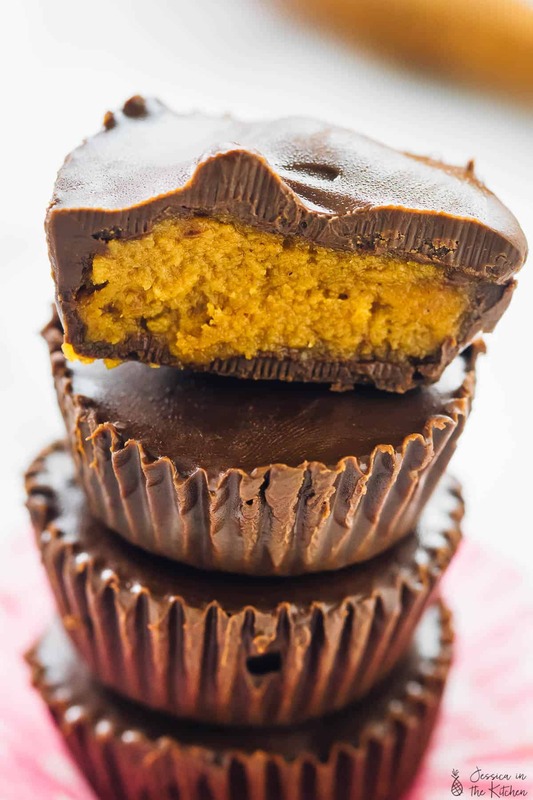 Dollop about ½ tablespoon of the pumpkin peanut butter into each cup. I like to roll it a bit in my hand first, then put into each cup and press down if needed so the final chocolate layer covers them. 7. Pour the rest of chocolate equally over each cup. Place in the freezer to set for another 10 minutes. Peel off liners, eat and enjoy!! 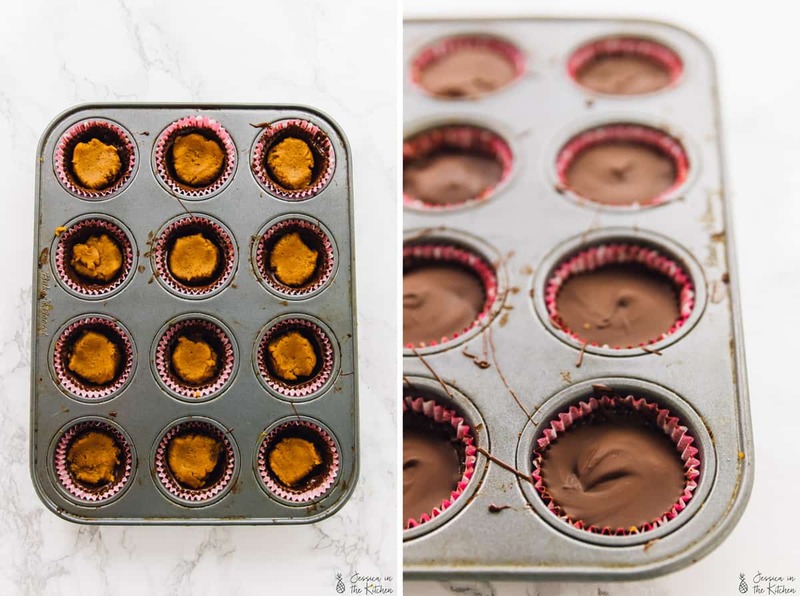 If you try this Pumpkin Chocolate Cups recipe please let me know in the comment section below, or tag me on instagram with the hashtag #jessicainthekitchen! For more exclusive recipes follow me on Instagram AND on Snapchat: jessinkitchen. Pumpkin AND Chocolate?!? Now, this I love! Cannot WAIT to try these! Gorgeous photos, too! Aww thanks so much Alma!! My daughter made these yesterday and they are DELICIOUS! So happy to hear that Maeve! !